However, it does peak around this time of year. Sprigs of gorse, or furze as it is sometimes called in the west of England, was at one time a traditional May Day gift between lovers in Devon and the surrounding regions. As you can see, I photographed the gorse, but I rather wish I had also picked a little of the blossom for a magical money spell. 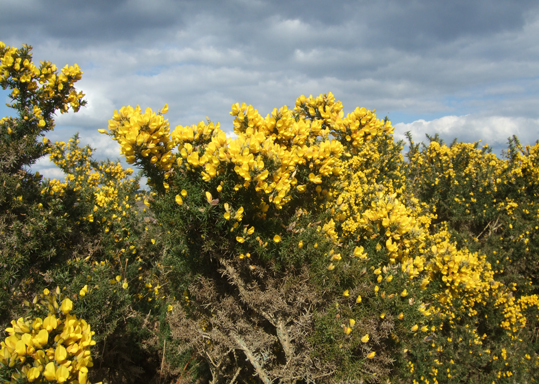 According to A Kitchen Witch’s World of Magical Plants and Herbs by Rachel Patterson, "Gorse is said to attract gold so makes an excellent ingredient in money spells and workings. It is also good for using in protection pouches." Traditional witch Melusine Draco, in The Secret People: Parish Pump Witchcraft, Wise Women and Cunning Ways, describes the medicinal uses gorse has been put to in the past: "Listed by Aelfric, gorse was used in a decoction made from the flowers and prescribed for jaundice and kidney complaints. A more modern, but traditional, recipe is used by Whitby fishermen to protect their hands and help heal cracks caused by cold and sea water." Melt a lump of lard gently and add as many gorse flowers as the lard will take. Leave overnight in a warm place for the lard to absorb the goodness from the flowers. Ideally, the mixture should be just warm enough to keep the lard liquid. Next day re-melt the mixture, strain out the flowers through muslin, then add more fresh flowers and leave overnight again. Repeat this several times until the lard has taken on a good yellow colour from the flowers; then it is ready to use. Note: This post is not medical advice. Always consult a qualified expert before taking any remedy.